With Thanksgiving almost upon us and Christmas just a breath away, I wanted to include a recipe that is simple, tasty and healthy…that is, if you omit the bacon. This soup has many layers of flavors that meld together perfectly. My father-in-law devours it and I recently had someone ask me if it was an old family recipe. I actually found it a few years ago in a magazine so here it is without further ado. Happy Thanksgiving! 1. Peel, seed and cube butternut squash. In 6 quart Dutch oven melt butter over medium-high heat. Add fresh squash, onion, carrot, celery, and garlic. Cook, stirring frequently, 10 minutes or until vegetables are tender. 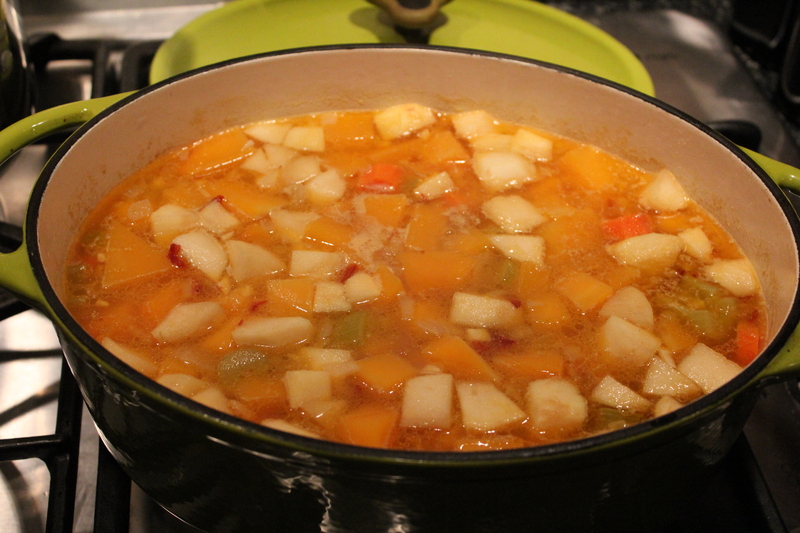 Add apples, broth, cider and chipotle peppers. Bring to a boil, reduce heat. Cover, simmer 25 minutes or until vegetables and apples are tender. Remove from heat; cool slightly. 2. When slightly cooled, puree in pot using an immersion blender. (Or puree in small batches in a blender; return soup to saucepan.) Blend in sour cream. Heat through. Remove from heat; stir in shredded Gouda until melted. Top with bacon. To make ahead, simply freeze the soup after it had been blended. You can add the sour cream and Gouda after it is thawed. great recipe! amazing how many things can be crammed in to a soup! we make a similar one, it goes something like this… squash, turnip, potato, carrot, onion, vegetable stock, sweet chestnuts, and a splash of cream at the end. Can be served with fresh coriander! hope you 4 are well! Ooh! That sounds good. I will have to try it out. We just put up the Christmas tree today. My holiday decorations are officially all done. It is amazing how the collection grows each year. Hope you are all well as well. 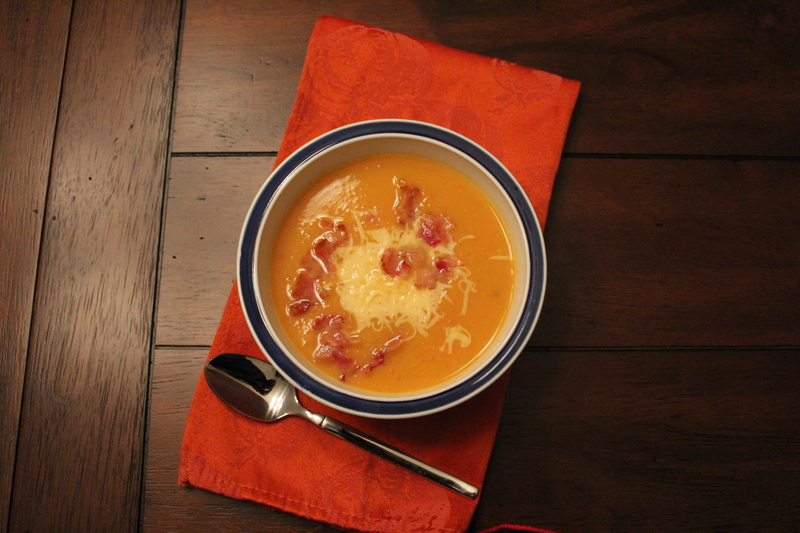 I will make this hearty soup, perfect this time of year!